Interested in a Life of Adventure While Serving God's Call? 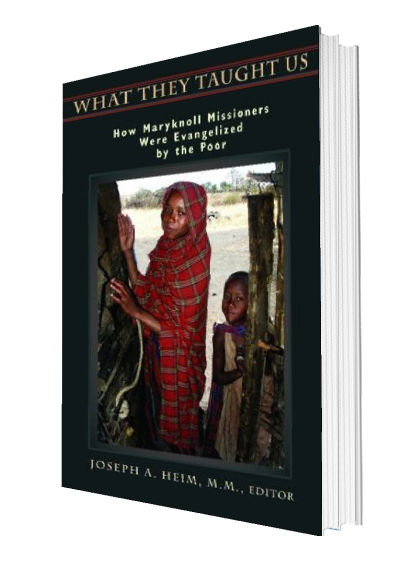 Discover more about Maryknoll and receive your complimentary copy of What They Taught Us. Know someone who would like this book also? For years, according to Fr. John Walsh, Maryknoll missioners have gone out "armed with seminary notes and skills and oozing righteousness, prepared to give but not to receive, to teach but not to learn." And most found out, often to their great chagrin, that "mission was a two-way street." Mission means carrying the good news of the Gospel to the four corners of the world but it also means taking on wisdom and knowledge from the people--about building a waterproof hut, about indigenous plants that heal, about patience, community, and living life fully in God's created world. This wonderful, 144 page soft cover book was written by Father Joseph A. Heim, M.M., who is now retired and living in El Paso, Texas, worked in mission for thirty-five years in Venezuela. The Maryknoll Fathers and Brothers is a community of Catholic missionaries bound together by oath. As a Society of Apostolic Life, we work exclusively overseas in 26 different countries of the world. Our mission is to actively witness to Jesus Christ through prayer and sacraments, feeding the hungry, healing the sick, and reaching out to outcasts. We work in many cultures, languages and religious traditions. Our call to serve the Lord takes us to many places around the globe in Asia, Africa, and Latin America. By working side-by-side with the most needy, we actively proclaim the kingdom of God and strive to promote a global vision of empowerment, building gospel communities and advancing peace and social justice as the mission outreach of the American Church. We are grateful to the Lord for our vocation to Catholic missionary service for nearly a century.